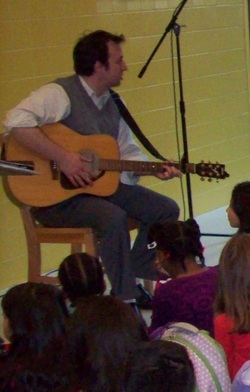 The music program here at AmPark Neighorhood is based on two overarching beliefs about music. First, music is meant be enjoyed. Therefore, children must have lots of opportunities to enjoy music through listening, singing, experimentation and play. Second, music is a force that brings communities together and at AmPark we use music as an important tool in knitting together our community of children, teachers and families. We also learn many new songs and add them to what has become our school repertoire. Through singing, we explore the fundamental elements of music such as rhythm, tempo, pitch and melody, dynamics (volume), story telling, listening and even the importance of silence. Each song we sing offers an opportunity to explore one or more of these elements. Music also offers a connection both to the past and to other cultures, and we sing folk songs related to cultures from around the world as well as the diverse history of the United States. Throughout the year we focus on many themes in music. For the younger ones, we initially focus on music that we can make with our own bodies, our hands and feet, and especially our voices. This becomes the ground work for the percussion instruments we will explore. As the children become older we pay a lot attention to rhythm and rhythmic notation. We do a lot of work with our “Orff orchestra” instruments. These instruments (which many folks would refer to as xylophones, but are actually a variety of pitched percussion instruments) are made for early childhood and are rich in sound and allow for children to explore many aspects of music while making a beautiful sound. These instruments are pre-set in the music room so we are able to maximize our time with them.